The base 2013 MINI Cooper Countryman ALL4 model is powered by a 1.6-liter inline-4 engine. The engine can produce up to 122 hp (91 kW) and up to 118 lbs-ft (160 Nm) of torque. The S version receives a turbocharger and that version produces up to 184 hp (137 kW). A base model would be not a good car for rally. It is just a regular and not very fast car too. It can sprint from 0 to 100 km/h (0-62 mph) in about 11.9 seconds (manual) – 11.7 seconds (automatic). It can reach a top speed of 114 mph (183 km/h). This car is great for city driving. It features an all-wheel-drive system. It comes with a manual transmission, but it also is available with an automatic transmission. It has a good fuel economy, and it’s not an expensive car either. It also has plenty of space inside the cabin. The 2013 MINI Cooper Countryman ALL4 in the picture above is powered by a 3.0-liter turbodiesel engine. The engine can produce up to 310 hp (231 kW) and up to 516 lbs-ft (700 Nm) of torque. The car in the picture above is a beast. Its engine is very powerful, and the car is really fast too. It’s a MINI Cooper that a base model looks silly compared to it. 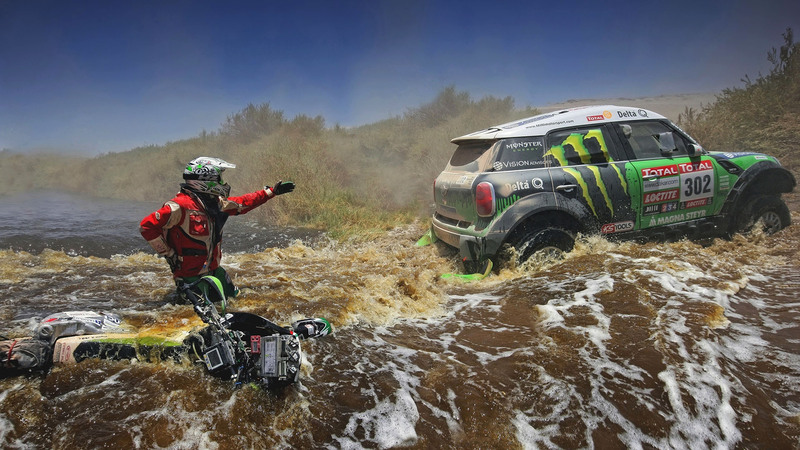 In 2013 Dakar Rally, Monster Energy X-Raid Team MINI Cooper won the first place. It was a surprise for many people, but it was no fluke. The original price for a base 2013 MINI Cooper Countryman ALL4 model starts at around 22,000 USD ($), on the U.S. market.